Economic development in Mexico has been uneven for generations, as some blamed the implementation of the North American Free Trade Agreement (NAFTA) for exacerbating the nation’s income disparity and leaving southern states like Chiapas behind. Dissatisfaction with the government’s economic policies and growing resentment regarding its indifference toward Chiapas eventually led to an all-out revolt in the state. 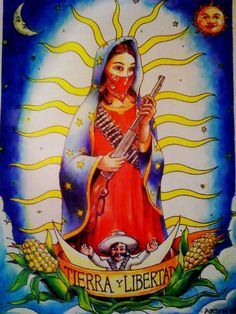 On January 1st, 1994, the day that NAFTA took effect, the Zapatista Army of National Liberation, a revolutionary leftist guerrilla group, went public and began occupying several areas inside Chiapas. 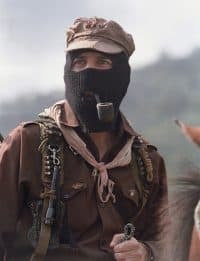 The Zapatistas and their primary spokesman, a mysterious, pipe-smoking figure known as Subcomandante Marcos, quickly gained international attention. News teams swiftly descended upon Chiapas to document the revolt, anxiously awaiting Mexico City’s response. 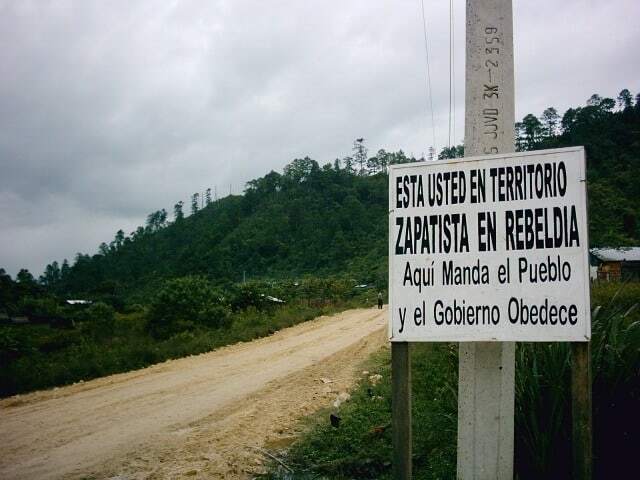 The rebels claimed several early victories, including the capture of San Cristóbal de las Casas, a prominent religious center, but counterattacks launched by the Mexican Army drove the Zapatistas into remote areas of the Lacandon Forest before the government called a truce less than two weeks later, on January 12. The revolt initially involved pitched battles over urban areas and soon became a low-intensity insurgency within the state. 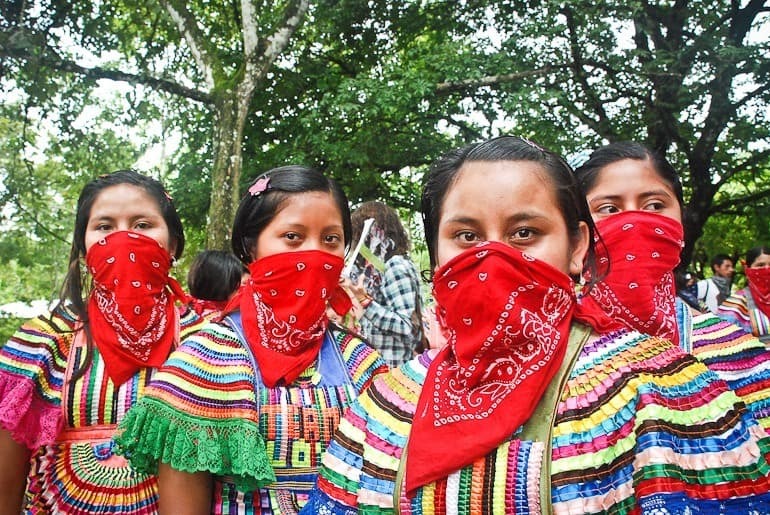 After years of fruitless negotiations, the Zapatistas organized a march to the capital in March 2001. The Mexican Congress ratified a watered-down indigenous rights law, which only angered the Zapatistas, who then suspended all dialogue with the government. The peace process has been in a gridlock ever since. The last violent incident occurred in 2014, when a Zapatista-related teacher was killed and 15 more were wounded in Chiapas ambush by alleged anti-Zapatista militia. The U.S. Embassy in Mexico City followed the revolt closely during its high-intensity phase, dispatching a group of Foreign Service officers to Chiapas to monitor the Mexican government’s responses. Ambassador James Jones coordinated American responses to the revolt and advised Mexican President Carlos Salinas in the days after the fighting not to resort to brutal suppression. Theodore Wilkinson served as Chief Political Officer at the U.S. Embassy in Mexico City during the crisis. William Dieterich was working with the United States Information Agency as a Public Affairs Officer when the revolt began. Dieterich and Wilkinson were each interviewed by Charles Stuart Kennedy beginning in 1999. Jones began his interview, also with Charles Stuart Kennedy, in 2002. Read about immigration from Mexico and the 1985 earthquake. JONES: Chiapas is the state that borders Guatemala. 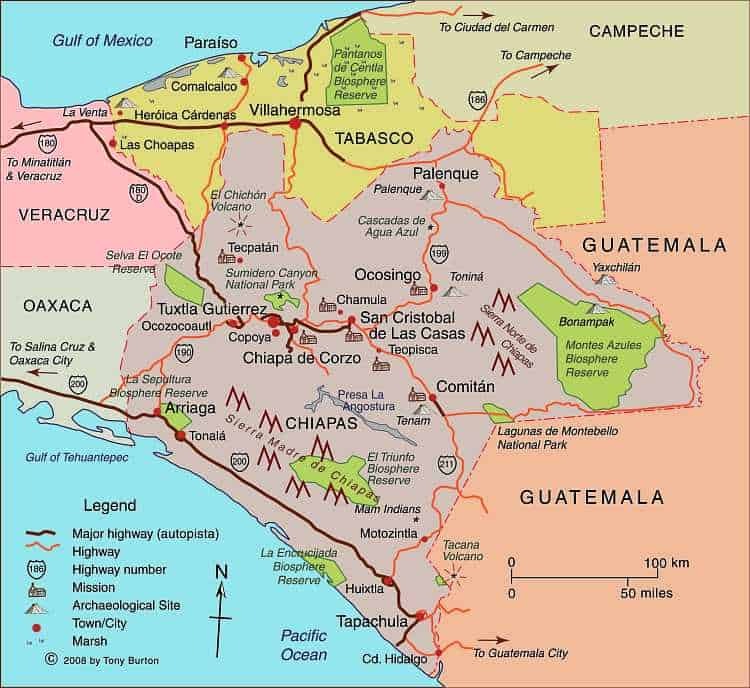 If the lines were to be redrawn, what makes a natural national borderline, Chiapas would be Guatemala; it wouldn’t be Mexico…. In Chiapas, you have a whole large indigenous population that doesn’t even speak Spanish. It’s different in many ways. You also have a system of not warlords, but similar to warlords, very powerful individual landowners who have kept the indigenous down for a long period of time. You have a different educational system. I happen to be Catholic. I went to a Catholic church there, I didn’t recognize it. They were twisting chickens’ heads off in church. Between the blood and fear, they were drinking Coca-Cola real fast and then belching. This was expelling the evil spirit. It was … really a form of paganism and yet it was a Roman Catholic church. So Chiapas is a different territory with different problems and very poor and it’s been ignored. On January 1, 1994, we had visitors from Washington, friends of ours whose kids were friends with one of our children, and they had come down to spend New Year’s with us. We were having breakfast or dinner or whatever and I get a call that there’s an uprising in Chiapas. I sent a team of three, four, or five from the embassy to Chiapas to look after the U.S. citizens who were there and to help evacuate them depending on the circumstances and to report back. So you had a consular officer, you had an intelligence officer, and a couple of military officers and a political officer. The first night, he reports back to me that they talked to one of the commanders in the military, and he said that they were going to secure the situation and then go “Indian hunting.” Immediately, I thought this could be a major disaster, because this is the day NAFTA [North American Free Trade Agreement] goes into effect. The next day, I called the Chief of Staff of President Salinas, who was a very smart fellow. I said, “This is the report our people give to me. You can’t do this.” What amazed me is how that’s the way it has always been handled in the past. You crush them, you wipe them out, and you go on the next issue. This liberal, or progressive, government went right back to the old ways of doing things…. 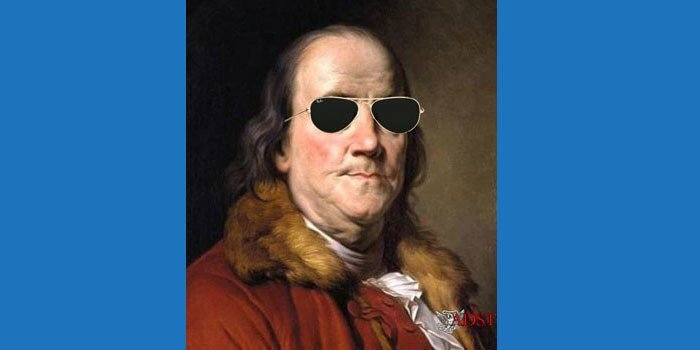 And I said, “I could tell you, and this would happen, that if you take this military action in Chiapas and crush the indigenous Indians, the United States Congress will pass a resolution condemning you, the government of Mexico. Our government will probably have to condemn you…. “Let me tell you about my experience on Wall Street. Here’s what the investors will do to you. They will drop you like a hot potato. If you have any desire to be a first-rate country, you won’t have a chance, because about 24 hours of a CNN war and investors will drop you so fast, you won’t even know where your head is.” I could tell that worked. I left. I had one other meeting with the Foreign Minister, who had been the former mayor of Mexico City and one who had not been chosen to be the President,…a guy named Manuel Camacho. I went over to his place. He was very paranoid, so we always met at a friend of his place. He was always telling me that everybody’s listening to it anyway and probably were. He said, “I totally agree with you. You must have had some impact because the President called me and said you were in and asked me what I thought about that.” In any event, they didn’t take the military action. They did put it into a context of a peace resolution. It has been contained and it’s sort of off the front pages now. WILKINSON: Really, there are three Mexicos: the northern, what is sometimes called Borderlandia, where Tex-Mex food prevails on both sides of the frontier, and people’s main source of income is in the States and their place of residence is in Mexico, where they either cross daily or they cross for a couple of months and then come back in the winter as long as they can do it legally and, as often as not, illegally. And so every time you talk about Mexico, you really have to look at it in the context of what region you’re talking about. Regionalism is more prevalent in a large country like the United States than in a small one, but in Mexico it’s even more prevalent because of the isolation of some parts of the country, which have never been exposed to centralized government in the sense that we know it…. On New Year’s Day, 1994, when having come off the tennis court, a doctor friend said, “You know that there’s a revolution, at least a revolt, going on in Chiapas?” Not the capital of the state but San Cristóbal, the second city (and perhaps more important city because it’s a religious center) of southern Mexico, has been taken by the rebels. It’s called San Cristóbal de las Casas (which is named for Bartolomeo de las Casas, the monk who was famous for standing up for the rights of Mexican Indians), and it was taken and held briefly by Indian revolutionaries and by a funny, pipe-smoking masked figure named [Sub]comandante Marcos. I went back to Mexico City late that day and found that my deputy political counselor, Ross Rogers, had taken the initiative, quite rightly, to get on the first plane he could to Chiapas and, in fact, got to San Cristóbal, borrowed a car from an American animal and plant inspection service facility down in Tuxtla Gutiérrez, the capital of the state of Chiapas, and took the car, drove the car to San Cristóbal, and got there before the army, so that the American embassy, true to form, was on the scene before the cleanup began. At that point at least the rebels had left the city. In the night they had come in and taken the place, and then they beat a strategic retreat, and when Ross Rogers got there, they had already left, but they had made their political statement. A number of people had been wounded and some killed in the brief action, and they went back into the forest, an inaccessible region of the Lacandona Forest and adjacent areas in the heart of Chiapas, which is still undeveloped, and they’re still there. Why are they still there and why hasn’t the Mexican army come in and simply wiped them up, which they’re perfectly capable of doing? The answer to that is that, one, they had a lot of support and sympathy from, you might call him, the “Red Bishop” of southern Mexico, whose name is Samuel Ruíz, who, as the religious leader of the region, has a lot of resonance on the political left, not only in Mexico but throughout Latin America. Ruíz felt they had legitimate claims and for years had been telling them that. So one could even say that he helped instigate this revolt by encouraging the Indians to believe that they were not treated justly by the Mexican Government. That’s one reason. A second reason is that no sooner had the news of this revolt spread throughout the world than hundreds of reporters and human rights organizations descended on San Cristóbal to make sure that the Indians weren’t mistreated by the Mexican army when it came in to clean up the place. So the Mexicans, Salinas’s government, which was already close to on its way out of office, because his term ended in 1994, decided that for political reasons it didn’t make any sense to simply come in and wipe these Indians out. Let them have their heartland of the Lacandona Forest (it has no strategic importance in Mexico; Tzotzil rather than Spanish is the language there.) And a number of high-level negotiators were appointed, all of whom sincerely tried to find some kind of a solution, whether to allow them nominal autonomy, some special provisions in the State Charter for their councils to be elected in a different way, for their taxes to be treated differently so as to respect their communal traditions. All of these efforts have failed to date, not just because the government hasn’t been willing to cede them local sovereignty or to rescind the 1994 elections or to take some national step that they demand or to agree to some exaggerated position on the part of the rebels, but also because the Indians themselves don’t really seem to know what they want. They’re divided; they’re obviously very difficult to negotiate with. So there’s a stalemate, and it continues even today. Q: Did you find yourself under pressure because this gained so much notoriety in the media and because there was a great deal of sympathy for the Indians? WILKINSON: No, by no means. This is one of those few issues where the United States wasn’t such a directly involved player that we were forced, for some political reason, to take a position that was difficult to sustain in the local context. Washington, of course, wanted to be sure that no human rights were violated, and for that reason we, I think, we kept somebody down there for a long time. Ross Rogers stayed for two weeks. My local Mexican assistant went down to help him and arrange appointments for him. I went down and spent a couple of weeks there in the end of January. I was succeeded by other people from the Political Section. So we kept somebody there for maybe six months on a rotational basis, even though, you know, there were little flurries of isolated aggravation. Maybe somebody would shoot a bullet out of the woods at soldiers, but there were no pitched battles any more. The Mexicans had been constrained not to go into the forest and wipe these people out, and the guerrillas in the forest knew very well that if they went out of the area, if they tried another sortie, they would be decimated. These were people living on the edge of the guerrilla area, and they eventually organized themselves into vigilante groups, and that has caused a series of separate problems. Some vigilantes a couple of months ago shot up a village and killed about 34 of the people and, again, quite naturally there was a great outcry from the human rights organizations — there’s no justification for shooting 34 people — but on the other hand, in order to maintain law and order, they have no recourse other than to form their own vigilantes…. This revolt in Chiapas in January 1994 came as a complete surprise, certainly to me. I had spent a week in Chiapas the year before, in 1993, traveling around talking to people, mayors. I talked to the governor. The governor was an old-school… what’s usually known in Mexico as a “dinosaur,” one of the old-school PRI politicians who believes very strongly in tough law and order but who, at the same time, said that he was very conscious of their need to develop the Indian heartland of the state and made all the right noises — no suspicion that anything was going on, brooding down there. The [embassy] attachés had been down once or twice, and they had one report that a patrol of army people had come across an armed camp somewhere in the forest and reported back that there was something going on, but this was one isolated report, and it got filed away, and nobody paid any attention to it. So even though [Sub]comandante Marcos had allegedly been training down there in the forest for some months, if not years – years, I think – nobody had really come across them, and if they had, they wrote them off as crazies, as you might write off some militia group in the United States, just a bunch of crazies who would never amount to anything. Oh, and when they did revolt and publish their manifesto, even leftists like Gabriel García Márquez, who at least used to be a sympathizer of the revolutionary left, people like that said this is archaic, these Zapatistas are talking about some kind of revolution that died with Che Guevara. This is classic Maoist revolution-rises-in-the-countryside, which has been proven to be fruitless — it doesn’t work. It’s a dead ideology, and it will never get anywhere. So disregard it; they’ll wither on the vine. Don’t worry about it. And what’s more, it’s the only place in Mexico where this kind of dissidence exists. This was 1994 or 1995. [Then] in 1997-98, you ha[d] other groups claiming to represent the revolutionary left arising in other states in Mexico, in the south. In Oaxaca and in Guerrero and even in Puebla, there are elements of several revolutionary groups, although they seem to be very fragmentary. But by 1994 none of these organizations had done anything, if in fact they existed then, and nobody had ever heard of any other revolutionary left in Mexico since the ‘70s, when there was a rural armed guerrilla group in Guerrero state. WILKINSON: I talked before about the division of Mexico into political parts and economic parts, and that certainly hasn’t changed. People said that Chiapas really had been left behind, even by the other southern states of Mexico, that there was a more enlightened regime in Oaxaca, for instance, for dealing with Indians, for respecting their communal traditions, more so than in Chiapas, which was really feudal. And of course, the state of Chiapas wasn’t even a part of Mexico for 10 or 15 years, immediately after the revolution. It was part of Guatemala, I believe, or separate somehow, and then there was a plebiscite to find out where it belonged, and the people, to the extent they voted at all, they voted to go into Mexico, and it reverted to Mexico in, like, 1840. So it was always different. And southern Mexico is backward, but if southern Mexico is a century behind the rest of Mexico, Chiapas may be two centuries behind the rest of Mexico, so there is that distinction. It’s a beautiful state. I love it. It has wonderful natural beauty. It has a forest which we were trying desperately in the early ‘90s to preserve as one of the regions of biodiversity of the world, and of course, once there was a revolution there and it became a political issue, then all the efforts to preserve the forest were completely forgotten, because how can you create a UN sanctuary in an area half of which is occupied by rebels and the other half by the army? So that sort of got forgotten and probably still has been forgotten. DIETERICH: [The revolt in Chiapas] started while I was there….I would like to tell you that there were those of us in the embassy who saw this coming, but that would not be true. We didn’t…. Chiapas is more like Guatemala than it is like most of Mexico. That official Mexico City-based ideology that says, “We are all Indians and we are part of this cosmic race that occurred in the New World, this wonderful mixture of Indian-Hispanic tradition” doesn’t … [penetrate] down into the Mayan country of southern Mexico. There were a lot of local irritants, and a lot of the Chiapas revolt focused on Mexico City not paying attention, but the real issues were a dispute between absentee or foreign landlords and local folks that hadn’t been resolved. Landlords claiming more land than they really owned, and people of indigenous culture claiming land that maybe they didn’t really own. A lot of irritants were land-based and culturally based. These local irritants in the hands of some fairly ambitious political operatives resulted in a minor armed revolt, and if you toted up the battles and the gunfire, there … never was a whole lot to it. Much of it has been a war of press releases, a war of television coverage, and a war on the Internet. Some of it was made possible by the fact that there was excess guerrilla talent coming out of El Salvador and Guatemala that could be applied to the game. There were people who knew how to fight guerrilla wars and there were people with a lot of guns. Anybody that thinks we have picked up all the weapons in El Salvador has not been paying attention. A huge amount of armament was also available in Guatemala in a war that was entering into more of a negotiation stage than it had been before. The Mexican government is in the same dilemma most governments are. No matter what your military people tell you, the human rights and political cost of totally stamping out a rebellion like that simply isn’t worth the game. It’s way too high. Despite the fact that a few telephone poles get blown up, the Mexican government is smart enough not to turn Chiapas into El Salvador.